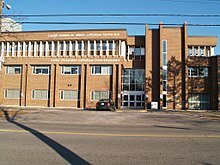 Conseil scolaire catholique MonAvenir (English: My Future Catholic School Board); previously the Conseil scolaire de district catholique Centre-Sud ("CSDCCS") is the Roman Catholic separate, French language school board for the South-Central region of Ontario. It is headquartered in the Centre d'éducation catholique Omer-Deslauriers (Omer Deslauriers Centre of Catholic Education) in North York, Toronto, Ontario, Canada. in the District of Parry Sound, the Town of Parry Sound and the Townships of Carling, McDougall, McKellar and Seguin. The school board's logo, before it changed its name to MonAvenir in 2017. As part of the province-wide restructuring of Ontario's school boards as a consequence of the passage of the Fewer School Boards Act, 1997, the French-language Separate District School Board No. 64 was created to take over the French-language schools previously managed by the area's separate school boards. 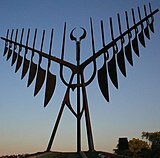 In Toronto, until 1998, the board was known as Les Conseil des écoles catholiques du Grand Toronto (CECGT). It was renamed as the Conseil scolaire de district catholique Centre-Sud in 1999. In May 2017, it was renamed to the Conseil scolaire catholique MonAvenir. The Board's schools cover the Greater Golden Horseshoe area of Ontario. The school board operates 46 elementary schools, 11 secondary schools, and two schools that provides both elementary, and secondary levels of education. ^ a b c d The school operates as both a elementary and secondary school. ^ "Budget 2007-2008" (PDF). Conseil scolaire de district catholique Centre-Sud. p. 7. Retrieved 2010-07-02. ^ ". : Mission et vision - CSDCCS :". Conseil scolaire de district catholique Centre-Sud. Retrieved 2010-07-02. ^ "Your French School." Conseil scolaire de district catholique Centre-Sud. Retrieved on March 11, 2011. "110, ave. Drewry, North York (Ontario) M2M 1C8"
This page was last edited on 4 March 2019, at 17:11 (UTC).